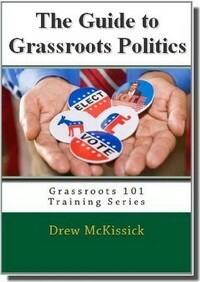 Given that politics is all about people, it’s a natural fit for the Internet and online social networks. In many ways the Internet is the ultimate “precinct” in America’s politics, in that everyone “lives” there. The overwhelming majority of registered voters have online access, and huge (and increasing) percentages of them regularly access political information online, which puts them only one step away from taking action – if someone offers them the knowledge and the opportunity. The fact that so many people are using the Internet for political information and activity means that you should see it as a natural extension of your activism. And while the Internet is becoming an increasingly effective tool, it’s also becoming easier to use, which puts everyone on a more even playing field. All of the fundamental elements of politics, (identifying, informing and mobilizing), have been impacted by the Internet. And as technology continues to change it will have increasing political applications, which means that you need to make an effort to use that technology in order to be as effective as possible. The Internet can aid your organizational efforts by allowing your supporters the opportunity to engage with your cause or campaign without having to come to a headquarters or go to a meeting. It makes it easy for you to be “found”, allows them to participate on their own terms, and lets them easily and more effectively “spread the word” to others they know. The Internet also makes it incredibly easy to do one of the most important preliminaries to grassroots organization – identification and recruit supporters. You can’t really do much in the way of organizing people until you have identified “who” cares about your issue, and you get this done with simple sign-up forms on a website, or even with free online petitions. Communications is key to being able to inform and mobilize supporters to take action. Whether it’s websites, social media or email newsletters, the Internet makes it easier for you to provide important information to your supporters, and makes it just as easy for them to share it with others. This also better enables you to inform bloggers and members of the “mainstream media” that may want to cover your efforts or provide “rapid response” to misinformation. The more of YOUR information that’s available online, the better you can help fill a factual vacuum that would potentially be filled by your opposition. Online organizing can aid with fundraising simply by providing a central place where supporters can make a contribution. 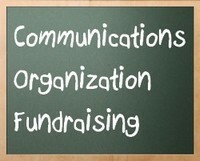 Once you’ve got a fundraising page, you can link to it in email, on printed material, on Facebook, Twitter, etc. Services like GoFundMe are great for most ad-hoc campaigns, or others like Piryx offer a cheap but more professional looking option for more involved efforts. They can also make fundraising viral, as it’s easier for your supporters to share a fundraising link with others, along with a message encouraging them to make a donation. You can approach online activity in one of two ways: either as an addition to what you want to do with an “offline” organization effort (such as precinct or church based), or as your only method of organization. Good online efforts can help enhance and increase the productivity of your “offline” efforts, such as recruiting volunteers, sharing information, coordinating action and raising funds. Whichever route your organizational efforts may take, you should plan to use the Internet as an integral part of your communications, organization and fundraising efforts.